This is the first full history of the ancient Georgia ever to be written outside Georgia itself. It is also an introduction to the substantial archaeological work that has been carried out in Georgia in recent decades. 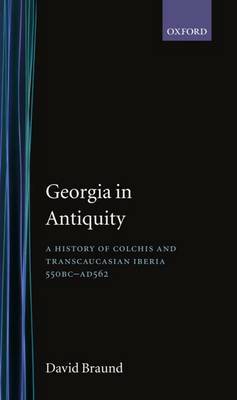 The principal purpose of this book is to open up ancient Georgia for the world of scholarship at large. It is not only the history of a neglected region, but also a sustained attempt to inform topics and issues that are more familiar to the historians of antiquity: myths of the periphery, Caucasian mountains and their passes, Greek colonization, the Persian, Athenian, and Selecuid empires, Pompey's conquest of Mithridates' empire, the development of the Roman frontier in the eastern Black Sea region, Roman diplomancy in Iberia, the Christianization of Iberia, Sassanian ambitions in Transcaucasia and Byzantine warfare there. The author has lived in Georgia for substantial periods during the last decade: he has made extensive use of scholarship in Georgian and Russian, and has first-hand knowledge of most of the sites which he discusses.